A "how-to" guide to low-cost, effective marketing for small businesses and franchises. Shows you how to out-think the competition without out-spending them. Includes case histories of successful low-cost publicity campaigns that make for lively reading. Includes a wealth of tips on how to get press coverage without paying for it, increase sales through "grass-roots" marketing, get publicity exposure by promoting charities, manage inexpensive promotions with the help of local organizations, and negotiate the best possible local radio, television, newspaper, or outdoor advertising deal. 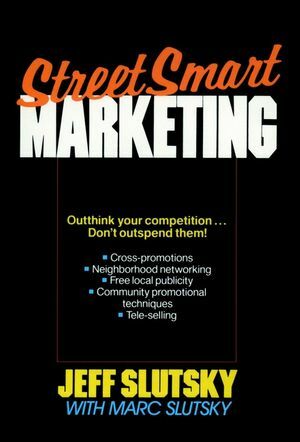 Jeff Slutsky is the author of StreetSmart Marketing, published by Wiley. Confessions of a Streetfighter--A Lesson in Chutzpah. 12 Ways to Isolate, Infiltrate, and Dominate YourMarketplace. Rejection-Free Skills for Community Cooperation. How to Profit from the Nonprofits. Surefire Strategies for Free Local Publicity. StreetSmart Tele-Selling and Mail with Moxie. How to Squeeze More from Your Mass-Media Budget. Converting Your Concepts to Combat.